Boone and Crockett harvest records reveal the best place in New England to harvest a giant whitetail in 2018. Deer researchers at Game & Fish Magazine discovered that there were three B&C bucks taken in Maine during the 2012-13 deer seasons. Two of them came from Oxford and bordering Androscoggin counties. An additional two B&C qualifiers came from northern Massachusetts in the same general region. Hunters should keep in mind, however, that nearly half of all NBBC entries score under 150 inches (gross score), with about 25 percent of entries topping out at 175 inches. Only 6 percent of entries score over 175 inches. What is it about Oxford County that makes it the top pick for Maine’s high-end trophy bucks? For starters, Oxford County contains approximately 2,000 square miles of upland habitat and another 100 square miles of wetland and water resources including lakes, ponds, rivers and streams. The human population is relatively low (28 people per square mile) and the winters are considered mild by Maine standards — which gives deer a slight edge when it comes to winter survival. Contained within Oxford County are 10 state-owned wildlife management areas, the largest of which is the Vernon S. Walker WMA in Newfield. This WMA consists of more than 5,600 acres of upland forest and some wetlands. It has had some recent habitat work completed that should benefit the whitetail population in years to come. Also, in Oxford County is the Mt. Agamenticus WMA, which consists of about 3,200 acres of upland forest and wetland habitat. The geography is primarily rolling hills with some mountainous terrain. Maine’s public lands, including WMAs, are not heavily hunted because these areas are generally thickly forested and contain fewer deer than does the surrounding croplands, early-successional growth, wetlands and other varied habitat that deer find more appealing. However, the region’s biggest bucks are known to roam for miles in search of receptive does, especially during the rut, which takes place in early- to mid-November. Camping and fires are not permitted on Maine’s WMAs but there are plenty of lodging options that cater to hunters in Oxford County. Most major towns offer hotel and motel accommodations and there are some campgrounds and campsites that remain open through the end of November. Hunters should consider consulting with WMA managers concerning new or recent clear-cutting operations, which draw deer from miles around to feed on the succulent new growth that appears after a wooded area has been cut. This is an excellent tactic during the rut because does will congregate near clear-cut areas due to the abundant browse that’s been made available, drawing roaming bucks in from considerable distances. With nearly 100 square miles of wetland and waterway habitat in Oxford County hunters may want to consider conducting a float trip along lake shores, rivers, streams, beaver flowages and open bogs where big bucks seek refuge, especially during the November firearms season. Floating is also an excellent tactic for October bowhunters because whitetails are often found near water in the early season, particularly before the rut begins. 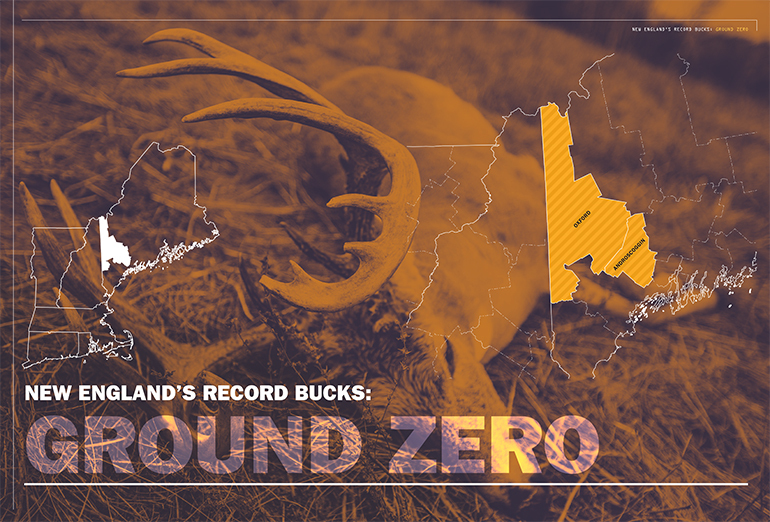 Fortunately for hunters seeking Maine’s biggest bucks, the general law allows hunting on any property that is not specifically posted against hunting or trespassing. This gives hunters in Oxford County access to nearly 2,000 square miles of mixed upland habitat with few restrictions on access except where the land is clearly posted against trespassing or hunting. The Maine Department of Inland Fisheries and Wildlife (MDIFW) has spent many years working with landowners in an effort to keep access free and open to hunters during the October, November and December deer seasons but cautions hunters to be courteous and considerate whenever they enter or hunt on privately-owned property. The MDIFW recommends that hunters make an effort to seek permission to hunt even on lands that are not posted simply to give the landowner a heads-up that there will be hunters on his property. Also, the department advises hunters to always respect the landowner’s wishes regarding road and gate access, safety zones (barns, homes, livestock enclosures, etc.) and other off-limits areas. In a word, the MDIFW urges hunters to treat the land as if it were their own, avoiding damage to gates, fences and roads and packing out all litter and refuse. The best time to approach landowners for permission to hunt is during the off-season, which is from January through September. This gives hunters ample time to find and meet with landowners to discuss boundaries, access issues, stand placement, road use and other details long before the deer season opens. When it is not possible to find a landowner or when hunting on lands owned by paper companies or other business entities hunters are encouraged to follow the basic rules of etiquette and fair play. Most lands posted in Maine are the result of damages incurred by trespassers who destroyed fences or gates, littered extensively, damaged property or trees, ruined access roads or otherwise caused the landowner to deny public access to their property. Once the signs go up they rarely come down, however, meeting with the landowner during the off-season and offering to help repair the damage or clean up the mess can give a hunter an edge down the road. Many “keep out” signs have been replaced by “Hunting by Permission Only” signs, which is a positive step especially for hunters looking to bag one of Oxford County’s exceptional B&C bucks. Roderick Rovzar has been hunting deer in Oxford County for more than 40 years. He and his friends have taken a number of impressive bucks from his base camp in Stoneham. He employs a variety of techniques including drives, still-hunting, stands and even watercraft to fool the county’s biggest bucks with impressive (almost amazing) regularity. “The key to success is not surprising: Know the territory you hunt, know the habits of deer, including the patriarchs within small herds of deer, and exploit them,” Rovzar said. “For hunters new to the Oxford County woods, it is important to scout for sign and trails. 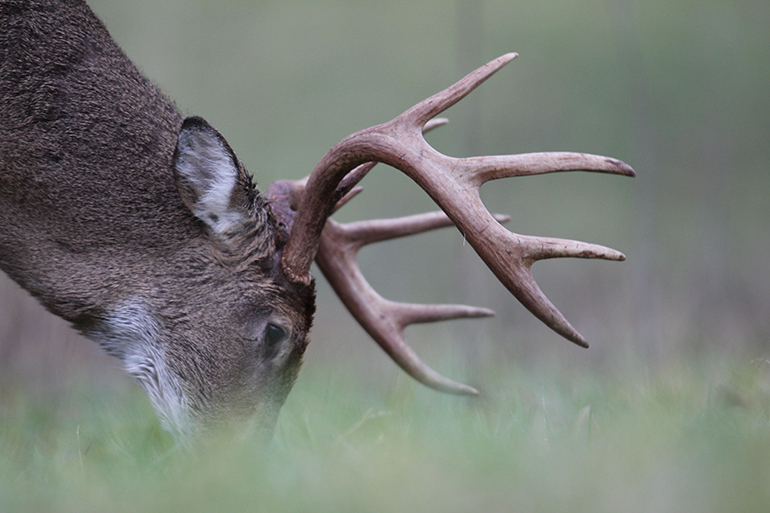 When the rut nears, finding scrapes and rubs heightens the prospects for seeing bucks. Hunters can usually find plenty of scrapes along wooded field edges and near water. “Once you find a good-looking area, look for a spot that provides a good view of the field and forest edge and plan to be there before dawn,” Rovzar advised. “Sit or stand near thick cover, minimize movement, avoid smoking and refrain from talking with your hunting partners.” Rovzar continued, “Sit for an hour or two after sunrise and then probe the woods in a big circle ending where you started; I would also plan to watch the area with the most sign for the last hour and a half of legal shooting time.” One Oxford County family of eight fills their tags every year, including some very impressive bucks, Rovzar said. And lastly, for the record, Maine’s all-time biggest typical buck scored 201 1/8 inches and was taken by Clinton Bradbury in 2004 in, you guessed it, Oxford County.